ANOTHER merger deal involving mid-cap developers is on. Last week, Plenitude Bhd announced a plan to take The Nomad Group Bhd private through a share swap exercise. Interestingly, Plenitude (fundamental: 2.7; valuation: 1.2) and Nomad (fundamental: 1.7; valuation: 2.4) are reported to be linked to associates of former finance minister Tun Daim Zainuddin. Before the merger plan was announced, Plenitude and Nomad were traded at price-to-book values of 0.64 times and 0.52 times respectively. Meanwhile, veteran stockbroker Tan Sri Ong Leong Huat is in the midst of using his flagship company OSK Holdings Bhd to acquire OSK Property Holdings Bhd and PJ Development Holdings Bhd in a move to create a first-tier property group. The mergers have prompted many to wonder which developers could be the next candidates for similar exercises. Common shareholding is probably one factor that will pave the way for a merger exercise. 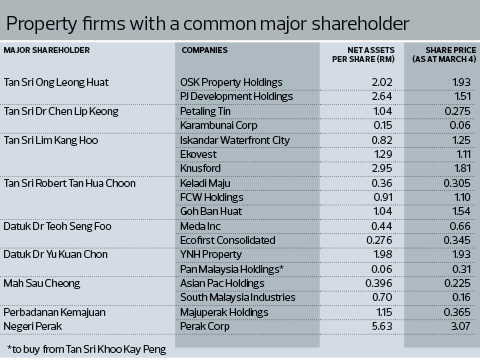 A quick check on the shareholding structures of property and property-related companies shows that there are at least 18 firms that are owned by eight tycoons or major shareholders, which could be or have already become potential merger and acquisition targets (see table). Among the notable deals is YNH Property Bhd chairman Datuk Dr Yu Kuan Chon buying a 69% stake in Pan Malaysia Holdings Bhd from Tan Sri Khoo Kay Peng’s Malayan United Industries Bhd. It remains to be seen if Yu intends to merge Perak-based township developer YNH Property (fundamental: 0.6; valuation: 1.6) with Pan Malaysia Holdings (fundamental: 0.4; valuation: 0.3), which is involved in the hospitality industry. Property companies that could be on the M&A radar include Tan Sri Dr Chen Lip Keong’s Petaling Tin Bhd and Karambunai Corp Bhd, as well as Mah Sau Cheong’s Asian Pac Holdings Bhd and South Malaysia Industries Bhd. In addition, Perbadanan Kemajuan Negeri Perak is the common shareholder in Ipoh-based property developer Majuperak Holdings Bhd and township developer Perak Corp Bhd. It owns stakes of 51.12% and 52.9% in Majuperak and Perak Corp respectively. Construction and property tycoon Tan Sri Lim Kang Hoo is the common shareholder in Iskandar Waterfront City Bhd (IWC), Ekovest Bhd and Knusford Bhd. However, a tripartite merger is unlikely, given that the three companies have different groups of substantial shareholders. Lim is teaming up with Kumpulan Prasarana Rakyat Johor Sdn Bhd in IWC (fundamental: 0.85; valuation: 0.3) and partnering the Sultan of Johor Sultan Ibrahim Sultan Iskandar in Knusford (fundamental: 1.25; valuation: 1.8). Besides, Datuk Haris Onn Hussein, the brother of Defence Minister Datuk Seri Hishammuddin Hussein, has a 20.16% stake in Ekovest (fundamental: 1.5; valuation: 2.4). Recently, the build-up of interest by Ecofirst Consolidated Bhd CEO Datuk Tiong Kwing Hee in Meda Inc Bhd could fuel speculation of a potential merger between the two, which also share another common substantial shareholder in Datuk Dr Teoh Seng Foo and his brothers. The Teoh brothers own 25.8% of Meda and 22.8% of Ecofirst. It is also worth noting that low-profile tycoon Tan Sri Robert Tan Hua Choon has 8.64% interest in Keladi Maju Bhd, 74.35% in Goh Ban Huat Bhd (GBH) and 25.35% in FCW Holdings Bhd, a contract manufacturing company that is diversifying into property development. FCW (fundamental: 1.35; valuation: 1.8) plans to launch its maiden property project next year. The company and IJM Land Bhd will jointly develop a 16-acre site in Jalan Segambut, Kuala Lumpur, with an estimated gross development value of RM1.3 billion. The Jalan Segambut land was acquired from GBH (fundamental: 2.05; valuation: 0.6) in 2007 for RM86 million cash. A senior executive of a listed property firm says the merger between Plenitude and Nomad is a good move, especially during the current slowdown, as Nomad’s assets will generate recurring income for Plenitude.